General public visiting hours are from 12 noon to 8 pm. Please try to limit the number of visitors to two at any time. One support person may accompany patients in emergency or patients having outpatient treatments or tests. Please wash your hands when you enter and exit the building, and before and after visiting a patient’s room. Handwashing is the single most important way to prevent the spread of infection. 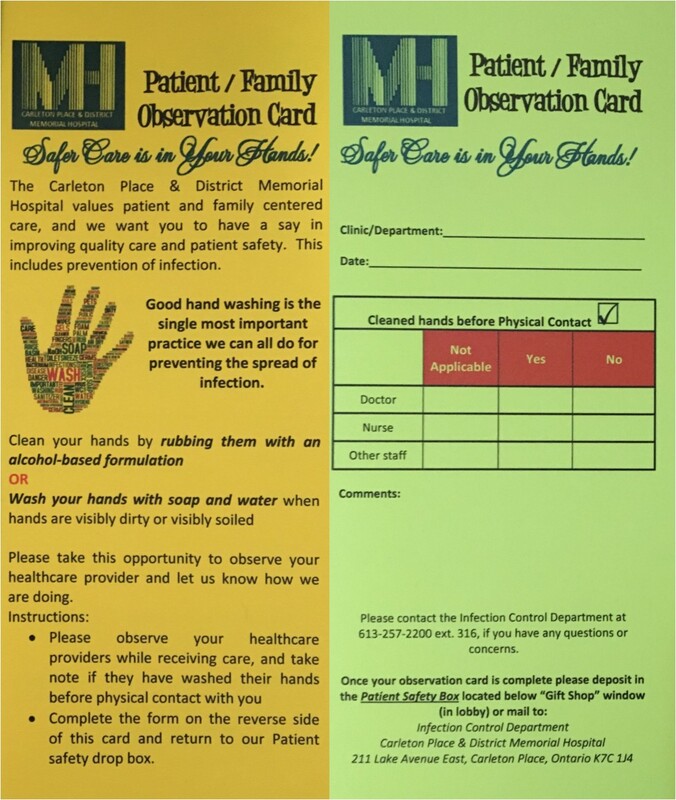 When you are at CPDMH, pick up and complete a Patient/Family Observation card and let us know how we are doing. Your input is important to us. If you are suffering from any of these symptoms please see your doctor and/or delay your visit until the symptoms have gone. We take extra precautions to prevent germs from being passed to others. It is very important to follow these extra precautions to protect our patients, visitors and staff. The signs on the doors have pictures of what you must do to keep everyone safe. Look at the sign on the door to know what you need to put on before you enter the room (e.g. gown). Before you enter and when you leave the room, perform hand hygiene with the alcohol hand rub. When you leave, remove gloves and put them in the trash by the door. Remove your gown and place in the laundry hamper by the door. Wash your hands with alcohol hand rub before touching anything else. If you are wearing a mask take it off and throw it in the garbage and perform hand hygiene again. Do not re-use gowns, gloves and mask – get fresh items each time. Do not leave the room wearing the gloves and gown for any reason, as this will spread the germs to other surfaces and people. Read the fact sheet given to you by the nurse. It provides further information. If you have any questions, please ask a member of your care team. They are here to assist you. We have a "no scent" policy for the protection of people with sensitivities or allergies to scented products such as perfume, cologne, aftershave, hair spray and deodorant. Please refrain from wearing them. These products can cause severe allergic reactions in some of our patients, volunteers and staff members. CPDMH is committed to a healthy, safe and comfortable environment for all our employees, patients, and visitors. As such, we are a smoke-free environment.